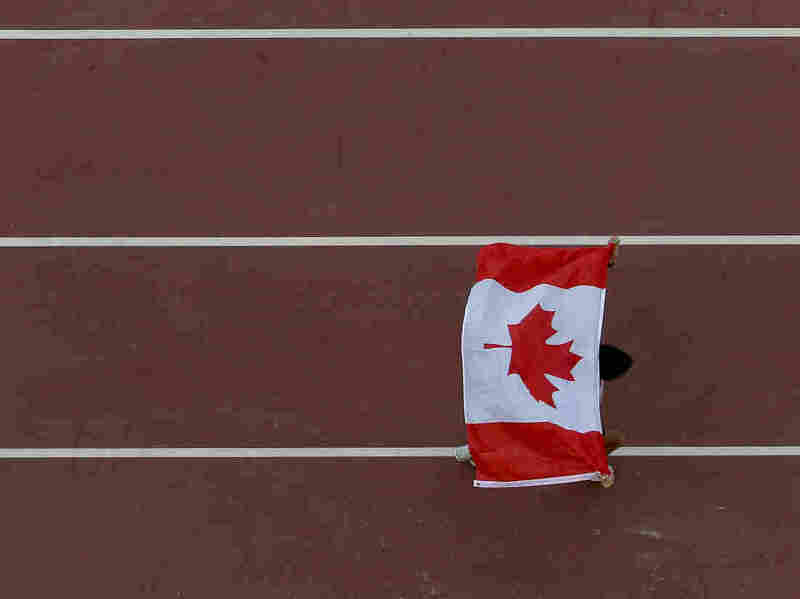 Canadian National Anthem Revised With Gender-Neutral Language : The Two-Way The second line of "O Canada," which has said the nation inspires patriotism "in all thy sons," will now read "in all of us." The change has passed the country's Senate. The House approved it in 2016. Canadian athletes will be singing new lyrics at sports events. Here, Benjamin Thorne of Canada celebrates after winning bronze in the Men's 20km Race Walk final at the IAAF World Athletics Championships in 2015 in Beijing. The Canadian national anthem is now more gender-neutral, after a bill that changes the lyrics passed the country's Senate. The second line of "O Canada," which has said the nation inspires patriotism "in all thy sons," will now read "in all of us." This has been in the works for a long time. According to the CBC, "Since 1980, when O Canada officially became the country's anthem, 12 bills have been introduced in the House to strip the gendered reference to 'sons,' which some have argued is discriminatory." The bill's supporters are thrilled, such as Independent Ontario Sen. Frances Lankin, who sponsored the bill. She tells the broadcaster: "I'm very, very happy. There's been 30 years plus of activity trying to make our national anthem, this important thing about our country, inclusive of all of us. ... This may be small, it's about two words, but it's huge ... we can now sing it with pride knowing the law will support us in terms of the language. I'm proud to be part of the group that made this happen." This bill was introduced in the House of Commons in early 2016 and passed there in June of that year. It was the "dying wish of Liberal MP Mauril Belanger," the Canadian press reports. "Belanger pushed the legislation for years, but it took on far greater urgency after he was diagnosed with ALS, or Lou Gehrig's disease, following the 2015 federal election." But it has faced significant opposition in the Senate. The bill that passed is primarily composed of sheet music of the anthem. It will become law following a formal royal assent, the Canadian press reports. Some conservative opponents of the bill are critical of the way it was passed. Lankin "introduced a controversial motion in the Senate Tuesday evening that would effectively shut down debate and immediately move to a vote on the bill," reports the CBC. Interestingly, "O Canada" actually started out as a gender-neutral song. According to The New York Times, the second line was originally "True patriot love thou dost in us command." It's not clear why, or at what point, the lyric was changed. Prime Minister Justin Trudeau called it "another positive step towards gender equality." "O Canada! Land of our ancestors. / Your brow is covered with glorious flower garlands. / Because your arm knows how to wield a sword / And knows how to carry a cross / Your history is an epic / Of brilliants exploits / And your valour is steeped in faith / Protect our homes and our rights / Protect our homes and our rights."